You may remember the shock and alarm over Aviointerior’s Skyrider seat, which envisioned packing more passengers onto airplanes by offering an abbreviated seat that was more like a saddle. The early version was never certified or taken very seriously, but the company is not giving up. At this week’s Aircraft Interiors Expo taking place in Hamburg, Germany, Aviointeriors is showing the Skyrider 2.0, which is a bit more sturdy and padded version of the orginal saddle seat, with poles securing the seat to the floor and to the ceiling of the cabin (to improve saftey) and the pitch the same claustrophic 23 inches as before. One of the more unusual and intriuging ideas on the list is something called a ‘Durinal,’ by Zodia Aerospace. On flights that aren’t full, Zodiac Aerospace’s new Eco Zlounge concept makes it possible for passengers to stretch out with a mechanism that allows the cushion part of the seat in front of a passenger to fold down, creating more leg room. No doubt the extra space will come with an extra cost, but on long flights passengers may be willing to pay that cost. See more finalists in my CNBC story, here. 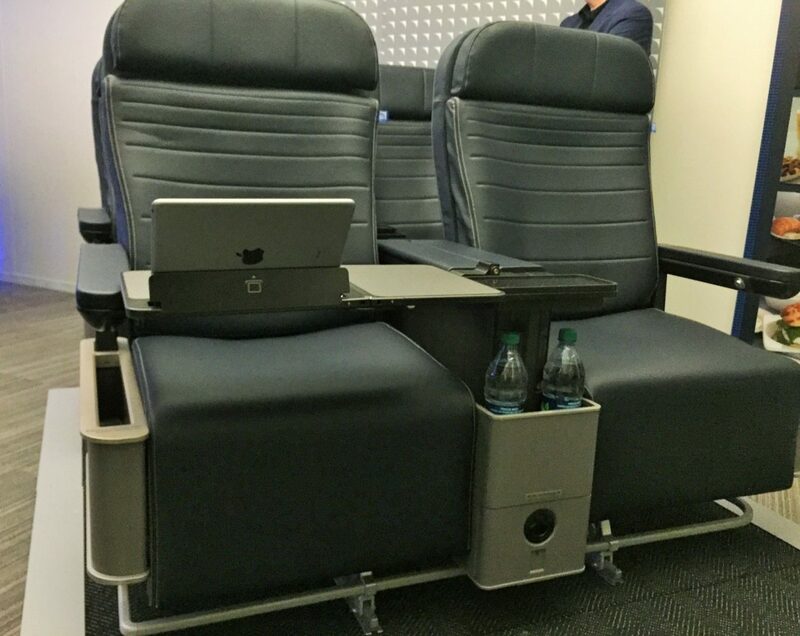 On Wednesday, United Airlines showed off the new seats that will soon be showing up in the first class cabin of the Airbus A319 and A320 aircraft the carrier uses on domestic routes. The new leather seats are a bit wider than the current seats and have some nice new features, including universal AC power plugs, more places to store your things, a wider center console that includes a space for water bottles, and a larger, more classy-looking, expandable drink table between the seats. The best part, though, is the tray table. Larger and sturdier than previous versions, this one draws on some of the patents held by Smart Tray and includes a built-in holder for personal electronic devices. I covered the “unveiling” for USA TODAY – here’s a link to that story. If you’re out and about in the Bay Area the next few days keep an eye out for Air New Zealand’s glass-sided tour bus, which is parking around town and giving folks on the ground a chance to try out the airline’s Premium Economy Spaceseat and Economy Skycouch, which are on the airline’s Boeing 777-300 service between San Francisco and Australia (via Auckland). Anyone who spots the truck and shares Tweets, messages and photos with Twitter @AIRNZUSA, Instagram @AirNZ or Facebook @AirNewZealand using the hashtag #AirNZ777300 will have a chance to win “surprise and delight” Air New Zealand swag. Visitors to the truck at any of its public stops will be eligible to win daily prizes. And – for the rest of us – there’s an online sweepstakes for two Economy round-trip tickets from San Francisco to New Zealand or Australia. 2014 will arrive in just a few days and here at Stuck at the Airport we’re making a wish list of amenities we’d like to see touch down at airports in the new year. We’re got a few more days to add to the list, so please let me know what fresh amenities you’d like to see in airports in 2014.